I’ve never baked a cake before… like from scratch. Sure, I’ve made plenty of cakes from boxed mixes. I’ve even dressed them up to make them look like I slaved away, but that’s not the same. This weekend, I made my first cake from scratch and it turned out really, really good. Well, okay, maybe just really good since I did have an issue getting the cake out of the bundt pan when it was done baking. If someone has a nifty trick to share with me about how to do this, I’d appreciate it. I did manage to get most of it out in one piece, but I had to do a little fancy fixing to the finished product. I took this cake to a Mother’s Day lunch on Sunday and it was met with rave reviews… even from self identified “picky” eaters. Here’s a helpful hint: Fresh Thyme has rose water in the aromatherapy section. Trust me, it is food grade and it is necessary for this recipe. It gives this cake a little something special. Cut rhubarb crosswise into 2 1/2″ pieces. Using a mandoline set to 1/4″ or a very sharp knife, slice rhubarb lengthwise, maintaining as much red skin on stalks as possible. Using a spoon, drizzle rose glaze over cooled cake, holding the spoon a few inches above the cake. 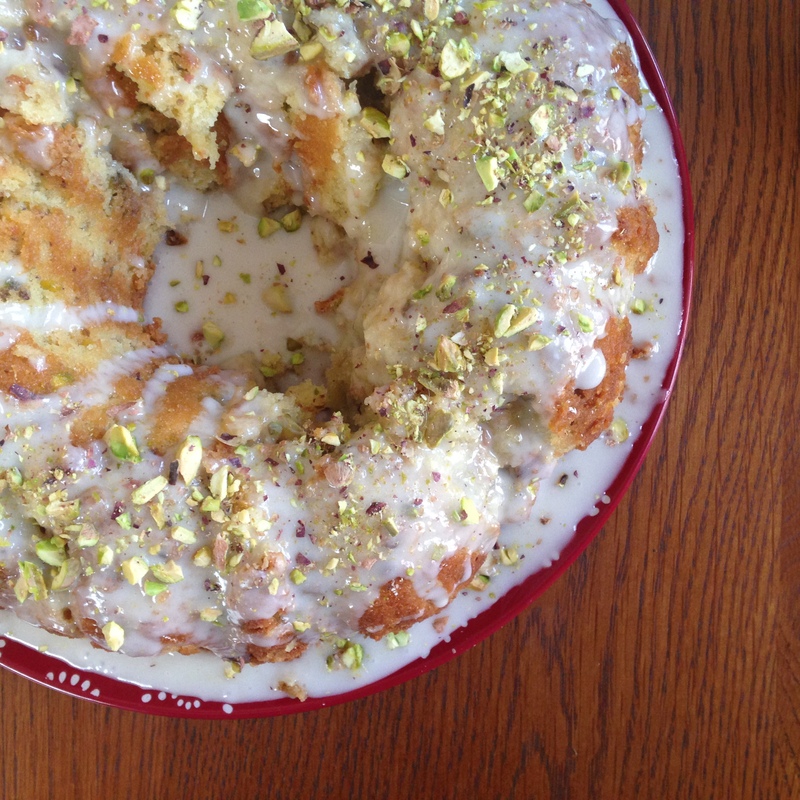 While glaze is still wet, sprinkle pistachios on top.